The wind and rain kept up throughout the night, pulsing through in waves. If I didn't have full confidence in the tent before, I certainly did now after withstanding two relatively severe Shetland Island gales. It was 7.30 and it wasn't raining, in fact on inspection the flysheet looked dry and there was every indication that it was a lovely morning. I became aware of the persistent and rather sad lament of a lamb close by. I'd seen thousands of lambs all over the islands, usually lounging or eating until my approach, then jumping up to find mum in a desperate panic. The bleating grew ever more plaintive, eventually I stuck my head out of the tent and there looking at me in astonishment was a baby lamb with a number 23 on its back. It became clear that it was marooned in my field and had been searching for a way out, whilst its mother and sibling (also number 23s) provided vocal encouragement from outside. In an effort to help, I tried to corner the lamb with an idea to either lift it over the fence or direct it towards a low spot in the wall for it to jump over. Needless to say, the lamb was a lot quicker than I was and with a look of terror on its face tried to headbut its way through the fence. Eventually it found a piece of fence with a wider mesh and squeezed through to be reunited with its family. They didn't seem very grateful for all my efforts. I ate breakfast and drank the last of the juice purchased from Andrew Halcrow's shop, whilst watching an assortment of orange hues dapple the hillsides as the sea lapped up on the shore. A brilliant wild camping morning. As I reached for the camera and began snapping away, I noticed the first of some very tall threatening storm clouds appearing over the hill behind me. I began packing up very quickly whilst the sun still shone, in the hope of keeping the tent reasonably dry. The clouds passed by slightly to the north and to the south of me travelling swiftly towards the north east. It was still warm as I pushed the bike across the fields to the beach and up to the road. Just spectacular. The south west wind made progress much quicker across West Burra, I decided to add to my island tally by crossing over the bridge to East Burra for a brief stay. Soon I was back at Hamnavoe and crossing the bridge to Trondra, reaching the mainland bridge in no time at all. Scalloway arrived on the left. As I changed down gears to take the corner and make ready for the hill, I made too many simultaneous demands on the front and rear derailleurs and the chain came off. I pushed the bike round the corner and propped it up on the barrier at the start of the Tingwall road and rethreaded the chain. I chose to go up the hill past the quarry, stopping at various points to take in the view. Due to the wind I stayed on the main road for a free cruise down to the junction by the golf course. Then came the long climb and brilliant descent in a long right hand sweep into Lerwick, no cars passed me on the way down. 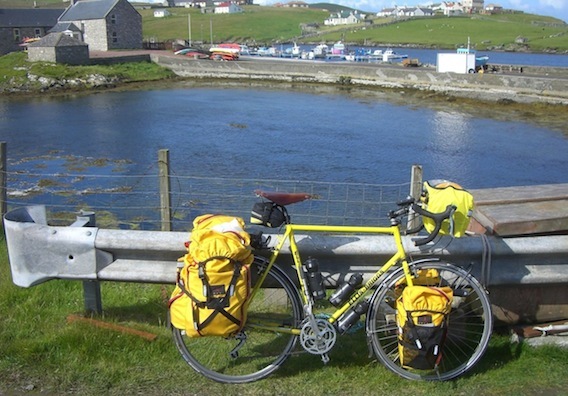 I dropped off the bags at the ferry terminal left luggage room and set off towards the city centre with the aim of crossing to Bressay. The MV Leirna was just arriving so I stopped and waited for the cars to disembark, the ferryman said that they were going straight back because they were too early. I wheeled onboard and we were off for the short crossing, the blustery bright conditions continued. Bound for the island of Noss on the other side of Bressay, I followed the road round before it turned inland where I stopped at the shop for Irn Bru. The countryside was empty and wild and magnificent. Several hills later the road started to drop down the other side and ended at a small car park. A rough track ran down to the Noss crossing point, the whole island was spread out below. I watched for a while from the top until I was satisfied that there was no ferry operating across the sound. It was very windy, I took lots of photographs, such a wonderful place. A small passenger ship was just off to the left, through the zoom lens I made out its name, the National Geographic Explorer. The route back was into an intense head wind, something of a shock after the day's eastern travel. One of the storm clouds scored a direct hit and I was caught out in the open briefly before reaching the lea of a lone building. 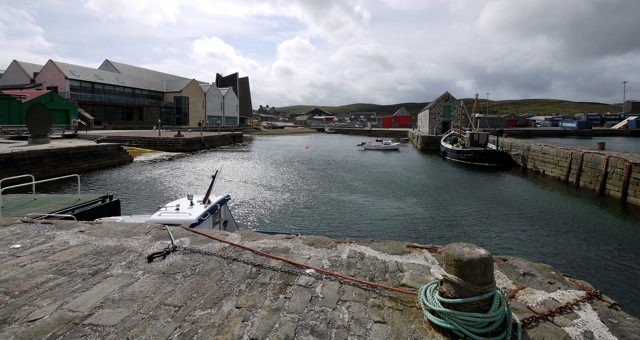 Back at the coast I stopped to take a panoramic shot of Lerwick from the Bressay waterfront before cycling round to the terminal just in time to see the ferry departing. I sheltered from the next rain storm by having a look around the Heritage Centre, which was really worth the visit. The lady kindly turned on the lights for me so I could get a clearer look. The Leirna was back again when I'd finished the visit so I boarded for the return crossing. Lerwick was bathed in sunshine and busy with visitors from a visiting cruise ship, the Spirit of Adventure. I mooched around the shops for a while and noticed the webcam dome by the Market Cross. I ordered sausage and chips from the Harbour Fish and Chip shop and ate outside, a man commented to me about the bike after recognising the EB logo, he was from Keighley. On the way out of Lerwick, I stopped at the museum and walked around Hay's Dock to take a look at the Mareel building project, ready in 2011. It was 16.00 so I just cycled back to the Northlink Terminal and picked up the bags, boarding would be at 17.00 for the 19.00 sailing. It began to absolutely poor down outside, I hoped that the cruise ship passengers had waterproofs. The Hjaltland steamed out of Lerwick on time. A little group gathered at the stern to watch the islands slip by, soon Sumburgh Lighthouse was alongside. The scene was so atmospheric with the setting sun surrounded by towering dark storm clouds stacked up behind the disappearing lighthouse.